One of the many impressive tasks that Innovation Law Center (ILC) research associates perform when writing proprietary reports for clients of the New York State Science and Technology Law Center (NYSSTLC) is getting up to speed very quickly with novel and often complex technologies. Becoming competent with groundbreaking biotechnology was certainly necessary for the report presented to Allied Microbiota, a New York City-based company that is developing a microbial product to remediate difficult-to-treat organic pollutants. 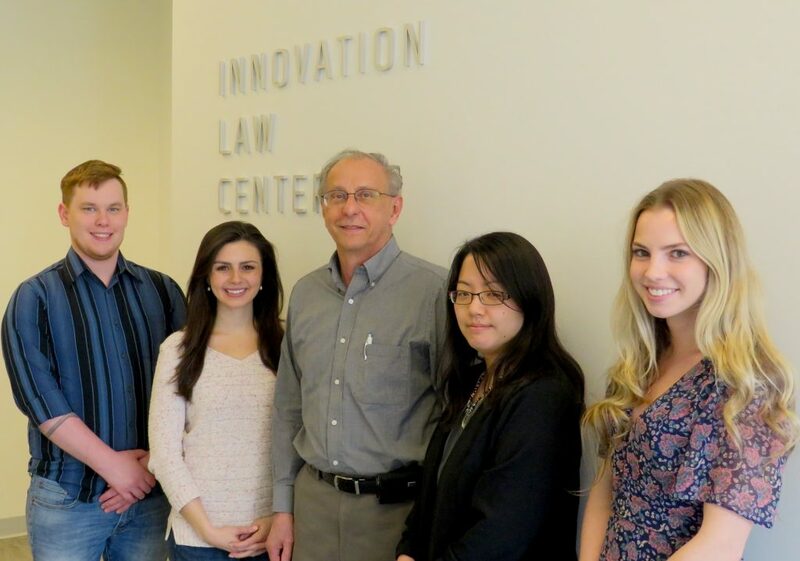 The Innovation Law Center team that worked on a proprietary research report for Allied Microbiota: 3L Trevor McDaniel, 2L Kristian Stefanides, Professor Dom Danna, 2L Christina Brule and 3L Gabrielle Sherwood. It helped to have a couple of College of Law students with biology backgrounds working on the report. Sherwood and Brule, along with 3L Trevor McDaniel and 2L Kristian Stefanides, formally presented their report to Allied Microbiota in March. Allied Microbiota Chief Executive Officer Frana James and Chief Technology Officer Dr. Ray Sambrotto describe the students’ work—which analyzes James’ company’s intellectual property claims, the potential market for its technology, and the regulatory landscape for bioremediation—as “really insightful.” “They offered us a new perspective about regulatory hurdles, prospects and certifications we probably need to get,” adds James. James says she discovered the Innovation Law Center through her connection to FuzeHub, a New York State manufacturing extension program supported by Empire State Development’s Division of Science, Technology & Innovation (NYSTAR). Through FuzeHub, James met NYSSTLC Associate Director Molly Zimmermann and ILC Adjunct Professor Dom Danna ’71. 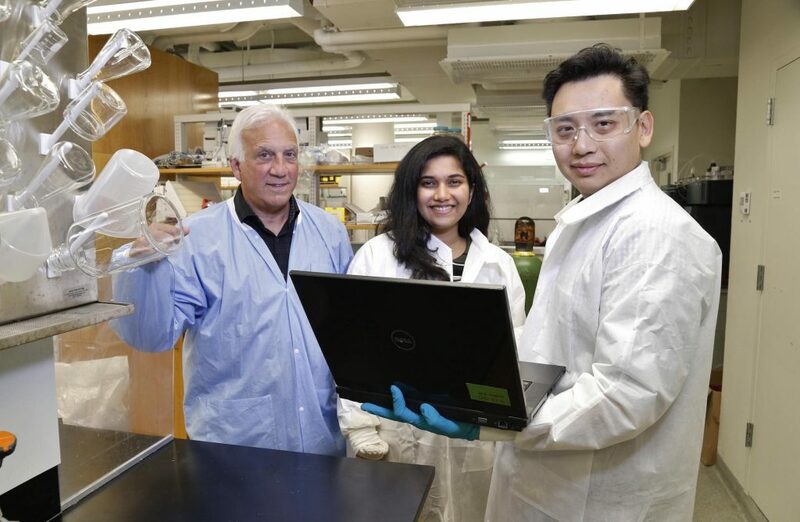 Eventually, Allied Microbiota joined 14 other startup technology companies that ILC students have been assisting, on behalf of NYSSTLC, during the Spring 2019 semester. A Columbia University-trained engineer with an MBA from the India Institute of Management, James founded Allied Microbiota three years ago with Sambrotto, a research professor at Columbia University’s Lamont-Doherty Earth Observatory. James and Sambrotto became interested in the commercial potential of biological soil remediation products that were being developed in the lab. Allied Microbiota principals: Dr. Ray Sambrotto, founder & CTO; Frana James, founder and CEO; and Michael Chin, director of technology. Despite some commercialization setbacks—as James says, “laboratory technologies can be difficult to scale up, and we certainly ran into our share of challenges”—yet fueled by funding and assistance from the National Science Foundation, PowerBridgeNY, SUNY Stony Brook, NYSERDA and others, Allied Microbiota is now in the large-scale testing phase for its PacBac product. PacBac uses naturally occurring, non-pathogenic thermophilic bacteria to naturally destroy soil contaminants that are difficult and expensive to clean up using current remediation technology. These recalcitrant contaminants include a rogues’ gallery of dangerous chemicals—dioxins, polychlorinated biphenyls, polycyclic aromatic hydrocarbons, benzene, toluene, and xylene—that are often deposited in soil by industrial processes, creating dangerously polluted brownfield sites. “The remediation market is huge,” agrees James. According to the U.S. Environmental Protection Agency, there are more than 450,000 brownfield sites in the United States and more than 1,300 “superfund” priority list sites known to be releasing extremely hazardous substances. James says the remediation market potentially could be worth $65 billion by 2025.